In case you think quilt creation for me is all beer and skittles, I want to take you behind the curtain and share my latest humbling quilting experience. I haven’t done such a bad job in years. I’m embarrassed to reveal my ineptitude, but I want to make a clean breast of it. Maybe we can laugh about it, sometime. In December I showed you “Deep Purple,” an improv created quilt top and asked your advice about how to finish it. The advice you sent was helpful, and I used it to complete the top. Recently, I started to quilt this piece, and what began as an improv quilting design devolved into a royal mess. First, I decided to quilt edge to edge with purple thread, following some of the angled pieced lines. Then, when I saw all the intriguing shapes those lines created, I decided to quilt the shapes separately – in a different color thread. The chartreuse thread I chose went well with the main non-purple color in my quilt, but I didn’t have as much of the thread as I thought. I placed an order for more, but it would take a week to arrive. 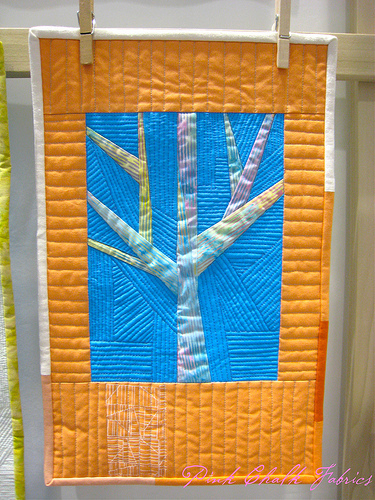 So, I quilted only three rounds in each shape with chartreuse, and filled in the rest with my purple thread. Oh, I also decided to change the quilting direction to just parallel lines. The process of yanking the quilt through my sewing machine’s harp with each round was hard on my machine and my arms. When I changed to parallel lines I decided to use my machine’s automatic tie-off feature so I wouldn’t have to hand knot and bury hundreds of thread ends. I’ve done this before and have gotten by with it. However, the purple thread I was using on the top and bottom stood out blindingly on the yellow-green backing fabric. Because the shapes were so awkward, I had to start and stop my quilting lines however I could. I did switch to a lighter bobbin thread once I saw what was happening. The change helped a bit, but the thread barf balls still show up well. At this point I wasn’t open to ripping out and starting over. Usually I steam press the daylights out of my tops to get them flat. However, “Deep Purple” has velveteen, which marks badly when steam pressed, so it was lightly pressed. Despite pinning, parts of the top were looser than others and the fabrics were different thicknesses, so the fabric scooched up along the bias lines I was quilting. The result was sheering and tiny pleats. I did redo some of the worst. Yes, I used a walking foot. Right now this mess hangs over a banister, awaiting some sort of edge finish. Like me, it looks OK from a distance in dim lighting. Up close it’s another story. I love hanging out with creative types because you never know what will spring forth from their brains. At a recent meeting I saw the ultimate quilter’s holiday diorama. The artist took an artificial foam pumpkin, cut off a third of it, lined it with sewing patterns, and decorated it for the holidays. There’s Christmas and Halloween/harvest quilts, two cats, baskets of yarn, fabrics, and sewing notions, a sewing machine, and even a cutting mat. The outside of the pumpkin is decorated with all sorts of charms, mostly skull related as the maker has a thing about them. Man caves have nothing on quilters’ caves. I knew I was in trouble when I saw more than five tops on my to-be-quilted list. And I cheat on that list as a series of small quilts aren’t even mentioned. There was nothing for it but to plunge into fitting up backs for my tops. So my main quilting related activity over the past week has been piecing together backs. I did free motion quilt a small improv piece and a wall hanging, but I won’t continue to bore you with my FMQ travails except to say that the piece below quilted up problem-free and the other one didn’t. Back to those backs, all but one is pieced as I like that look and I have very few large pieces of yardage. I even pieced a back for a top still on my design wall. I gave myself an extra scoop of coconut chocolate chunk ice cream for that bit of forward thinking. To keep up the pressure on myself to get stuff finished, I’ve paired my tops with their backs and hung them in my fabric closet. That way every time I venture into my stash I’ll experience guilt about the unfinished stuff and start quilting instead of piecing. At least that’s the theory. It’s really hard to see the quilting in most pictures of quilts, which is frustrating. I look for all the examples I can get as it’s the quilting that can take a quilt from fine to fabulous. Since I’m not even up to novice level at free motion quilting I’m always excited when I come across pictures of quilting that’s achievable with a walking foot. 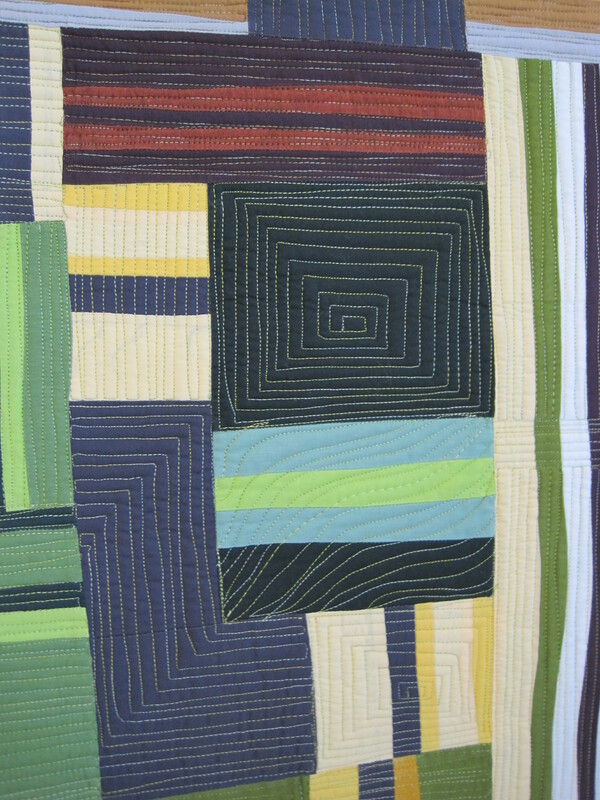 Thank you, Google and Bing image searches, and modern quilters who think straight lines are just fine. Of course, nothing beats seeing the quilts in person. I guess that’s why my quilting friends are always up for road trips to shows. The quilt at the top was exhibited at FAVA in Oberlin, Ohio, this year. The picture shows only part of the quilt. The one on the bottom was featured on the Pink Chalk Fabrics blog.